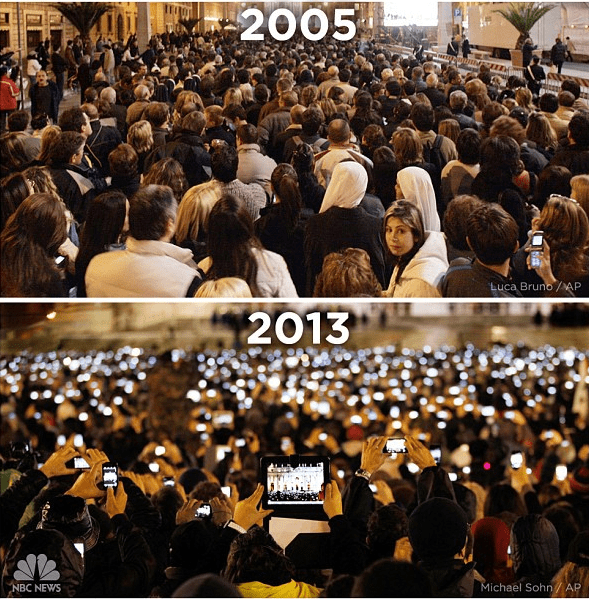 Consider for a moment how the below photos taken in St Peter’s Square in Vatican City during the 2005 announcement of Pope Benedict XVI and the 2013 announcement of Pope Francis relate to the statistics above. 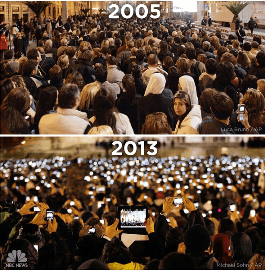 Looking at the juxtaposition between the two photos it is at once obvious that there has been a dramatic shift in the how we view and interact with the world around us. The above two photos haven’t been photoshopped or altered in any way but rather reflect how the way we use technology has become instant, interactive and mobile. As cultural consumers, we are no longer content to be passive spectators; we now want to be active participants. We want to be able to take a photo or a video of an event we are witnessing and instantly share it with friends and family. We also want to have constant access to information even when we’re on the move. In fact, the term ‘instant’ which was once considered the work of science fiction has now very much become the everyday ‘norm’. The way in which universities and colleges present information must change in order to accommodate how students access information. Armed with this information, it’s impossible to fathom why every university and college isn’t taking advantage of responsive design. Remove any excess content so users don’t have to scroll down too much on a mobile page. Responsive design isn’t an optional, additional design feature, that’s nice to have but not an absolute necessity. What responsive design really means to your institution is the difference between a positive and negative user experience which could well be the deciding factor between a student applying to your university and that student moving onto the next university on their list.